Grand Rapids: Check it out ! After a peaceful night’s sleep, we pad down to the main floor of the City Flat’s Hotel for breakfast in City Sen Lounge; not being early risers, we have the place to ourselves. A table by the window affords us a view of the going’s on up and down Monroe Center St. The sun shines brightly in the cloudless sky, folks are dressed a little lighter today as we are expecting above normal temps. 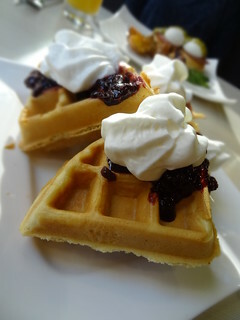 Breakfast arrives, Kris is having waffles topped with macerated blackberries and a dollop of vanilla whipped cream. For myself, City Benny, poached eggs, ham and béarnaise sauce on brioche and a side of salted baked potatoes, yum! We take a detour through the building on the way back to our room, the sign says Ballroom at City Flats, we want to check it out. 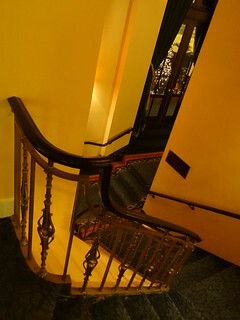 Up the double stairway we go to 77 Monroe Center, the room is stunning, not at all what we expected. 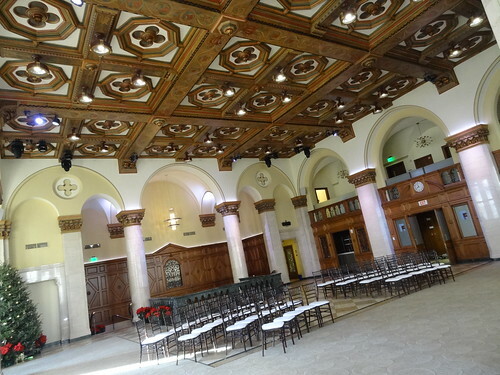 Gorgeous wood panels, beams stenciled in a floral design, elegant archways line the room, columns and a balcony. The room is being prepared for a wedding later in the evening, what a snazzy place for a reception or party! 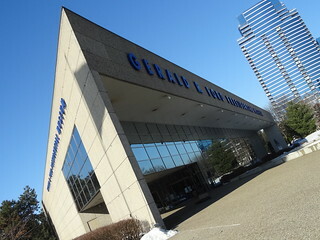 We are checked out of the hotel, we leave the Jeep parked and walk the short distance to the Grand Rapids Art Museum (GRAM). 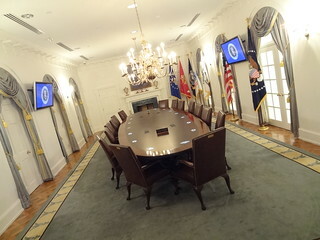 The 125,000 sq. 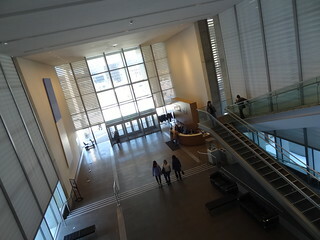 ft. Contemporary-style building opened October 2007, it is the world’s first Gold Certified LEED art museum. 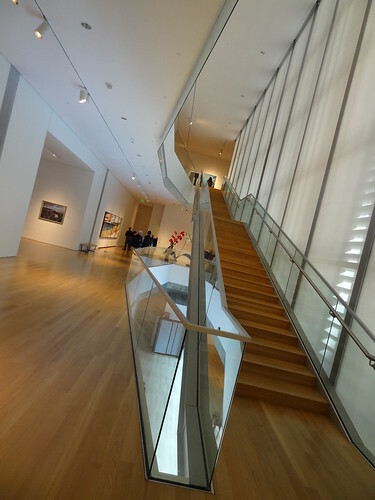 Stacked 3-stories tall we ascend the elongated stairway to the third floor where the permanent collection is on display. 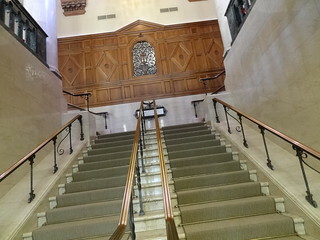 Light floods the galleries through glass skylight lanterns, walls are white, floors pale-colored wood, hallways are vast. 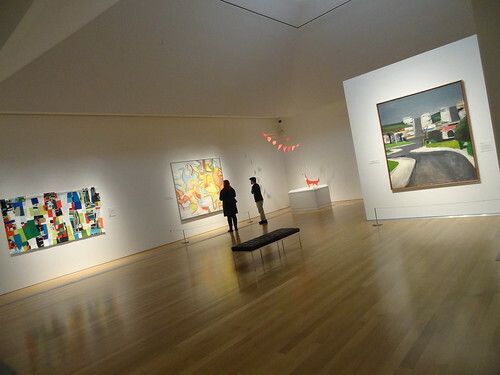 Alongside permanent pieces we find selected works of art from ArtPrize 2013, chosen from 9 different venues we see paintings, drawings, photographs, sculpture and textile art. My favorite piece on the floor is by Sophia Collier, she carves water-like surfaces from acrylic block, it’s like looking at an actual piece of the water’s surface! 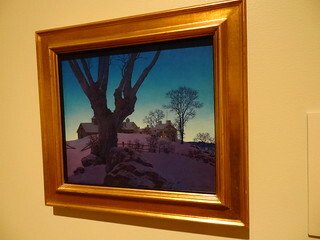 The second floor is home to temporary exhibits, featured today: Masterpieces of American Landscape Painting 1820-1950. Pieces represent America through the eyes of painters such as Thomas Cole, Martin Johnson Heade, Winslow Homer and Georgia O’Keeffe, a total of 48 paintings on loan from the prestigious collection of the Museum of Fine Arts, Boston. Large gold-framed landscapes hang on gallery walls, they are absolutely lovely. 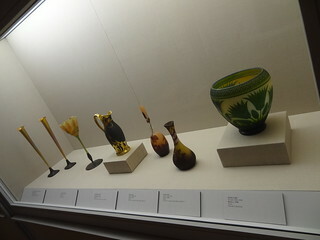 20 works of art are on a 5-year loan, pieces are by well-know artists such as Picasso, Renoir, Rodin and Mary Cassatt grace the museum. 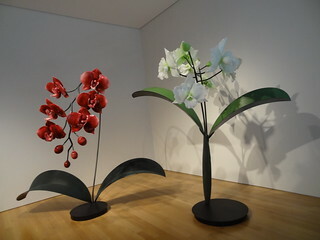 A pair of giant Orchids stand tall near the stairway, everybody wants their picture taken in front of them. We study Joey Ruiter’s Objects in Motion; prototypes of bicycles, cars and a motorcycle…. quite interesting. We both like the Modern Furniture Collection, after all, Grand Rapids is Furniture City. 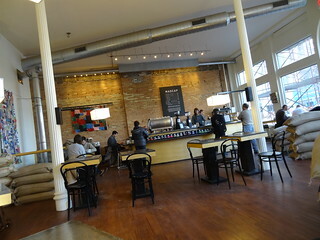 We cross over to the other side of Monroe Center to catch a coffee at Madcap. With a fine reputation for roasting, retailing and wholesaling specialty coffees, we thought we’d try ’em out. It is definitely one of those places where the hip crowd hangs, not to worry, regular folks are equally welcome. It’s a nice space, bright, lots of windows. As soon as we get inside we are treated to the scent of fresh ground coffee, burlap bags of coffee beans are stacked on the floor, the beverage menu is behind the coffee bar. Kris orders a cold brew, while I go with an iced mocha, we take a seat and plan where to go next. 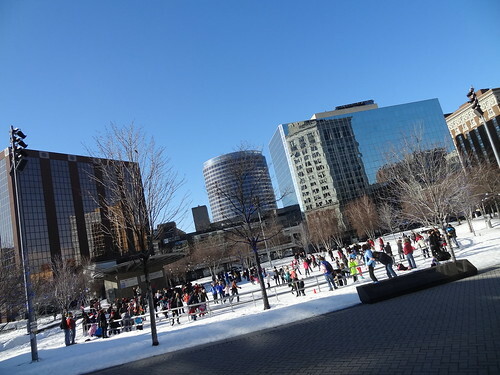 Outside the sky is the color of summer, we walk back to the ice rink, families crowd the ice, the littlest of skaters use a walker-like object until they get the hang of it. 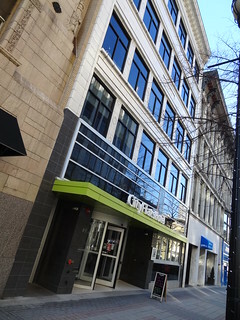 The architecture downtown is marvelous, much of it Late-Victorian in style, buildings are ornate, the Ledyard (the first location of the Grand Rapids Public Library) is outstanding! 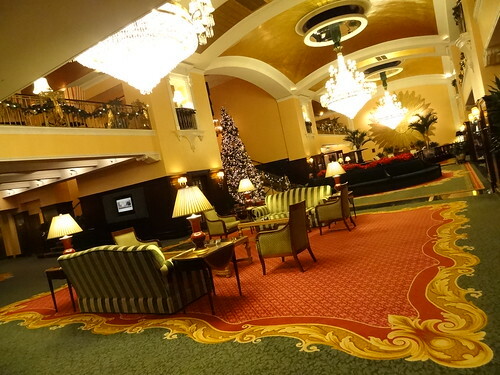 We find ourselves in front of the Amway Grand Plaza Hotel…..never pass up an opportunity to go inside! Originally called The Pantlind Hotel, it was built in 1913, know for its elegance and grandeur, it has one of the world’s largest gold-leaf ceilings. 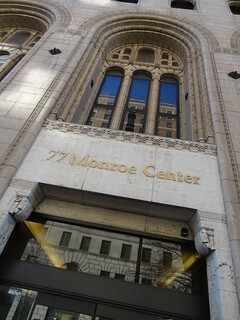 Purchased by Amway, the original building was refurbished, a glass tower added, it re-opened in 1981. 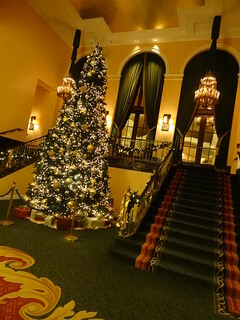 The lobby is magnificent; the gold-leaf ceiling glistens in the light of the three impressive crystal chandeliers. Poinsettia surround the centrally located fountain, potted palms flank the room, wood is dark walnut, furniture is arranged in cozy settings. We peek into the ballroom, Corinthian columns and a sculptured ceiling are straight from a bygone era, the chandeliers even match the ceiling pattern. Gerald R Ford was the 38th President of the United States, serving from 1974 to 1977, he was the only President from Michigan. 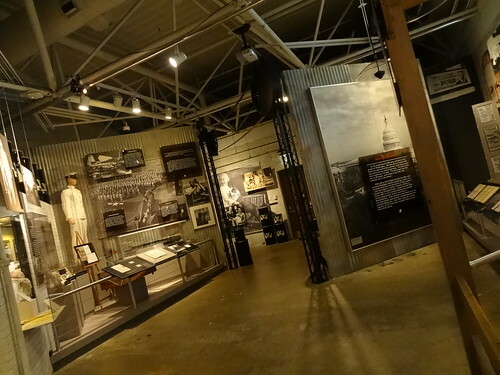 The museum bearing his name sits along the Grand River, covering his life from childhood to star football player, Naval officer to US Congressman, Vice President to President, it tells the fascinating story of Grand Rapid’s favorite son. 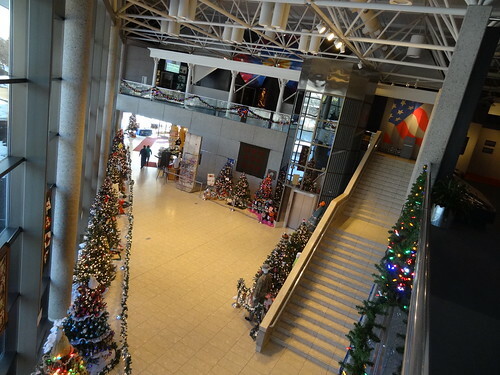 Just inside the museum stands a section of the Berlin Wall, Christmas trees line the lobby area, a large Seal of the President of the United States hangs on a wall. We begin our tour by watching a short film on Gerald Ford in the crescent-shaped theater, it will give us the background on what we will be seeing in the exhibits upstairs. 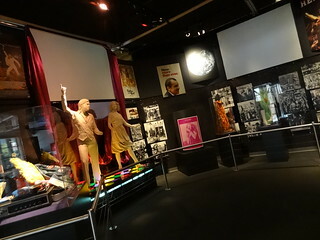 On the second floor the mood is set for the 1970’s; Fads such as the Pet Rock, Mood Rings, platform shoes, 8-tracks and Disco were alive and well. Photos of Janis Joplin, John Lennon and Yoko Ono represent the music of the time, Posters feature Peace signs, videos chronicle war protests and marches, these were turbulent times. 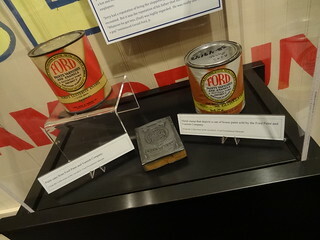 Displays take us through his youth, born Leslie Lynch King, his mother later married Gerald R Ford, whom he was named after. His life was earmarked by hard work and the successes that came from it, he served 25 years as the Representative from Michigan’s 5th Congressional district. Ford was the first person appointed to the Vice Presidency after Spiro Agnew resigned amid controversy, he became President August 9, 1974 when Nixon resigned. He is the first and only person to have served as both Vice President and President without being elected. 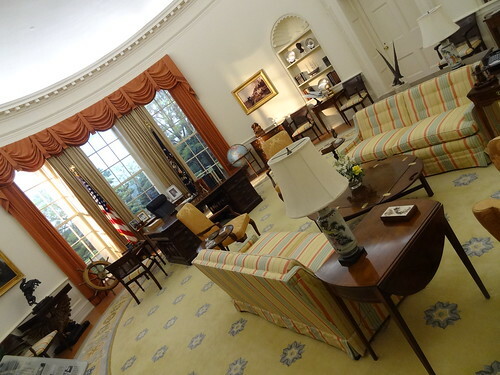 The museum is engrossing, well laid out, it is easy to follow and understand, the life-size replica of the Oval Office and Cabinet Room are pretty cool. 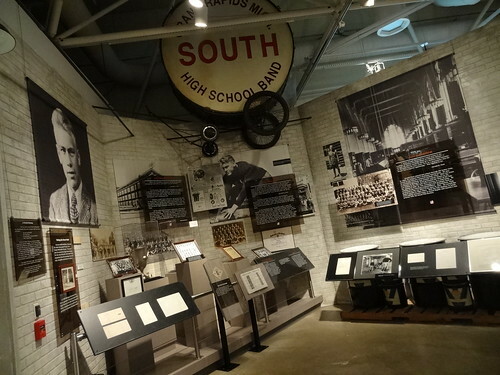 I have to say, I think anybody visiting Grand Rapids should make it a point to come to the museum. 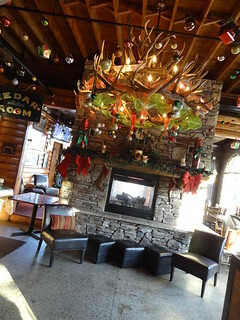 The day before we passed The Grand Woods Lounge, it looked super charming, so today we are having lunch here. Resembling a cabin up north, the interior has a wilderness feel to it. 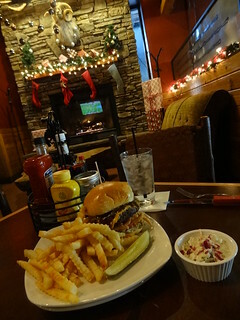 Log and stone walls, several fireplaces, it is modeled after restaurants in the Pacific Northwest. We are seated at a table near a fireplace, through a door we can see the outdoor heated porch, I imagine it’s packed on the weekends. The menu consists of sharable appetizers, salads, sandwiches and entrees; our waitress is quick to take our order and bring our drinks. The Rodeo Burger is a 1/2 pound patty topped with crisp bacon, melted cheddar cheese, haystack onions and a tangy BBQ sauce, it is prepared perfectly. Alongside the burger is a generous portion of fries and a side of slaw, delicious. 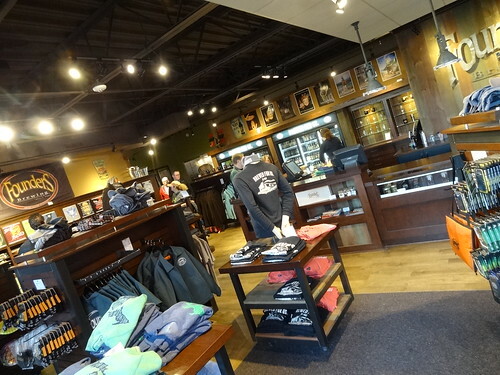 Our last stop for the afternoon is Founders Brewing Company, ranked in the top four breweries in the world, they recently opened a brand new Tap Room. We park in front of the building, we can hardly believe our eyes, it is late December, the outdoor patio is packed with customers. 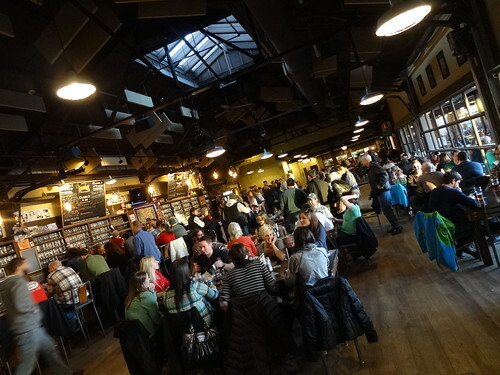 Inside, the German Beer Hall-inspired Tap Room is even more crowded, the room is gorgeous, the high, wood beam ceiling puts you in the mind of Germany. A glass wall allows patrons to look in on the brewing process, I love that. The line to order beer and food seems endless, we try our luck outdoors. 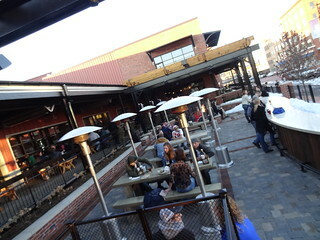 A group of gentlemen make room for us at a table, heat lamps and fire pits keep the temperature comfortable. 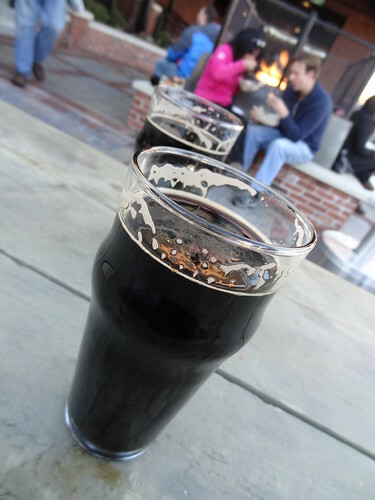 Before we know it our pints arrive, we are each trying a different type of Stout, both are delicious. There is a constant flow of people coming and going, the food that passes us by looks tasty…….next time. 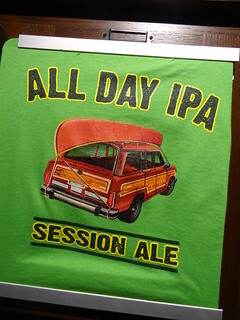 We stop in the gift shop, T-shirts bear the names of their most popular beers, clothing and accessories wear the Founders badge. People come from all over for the beer and a souvenir. We have had a wonderful weekend in Grand Rapids, but the time has come to head back to the D, we’ll be back! 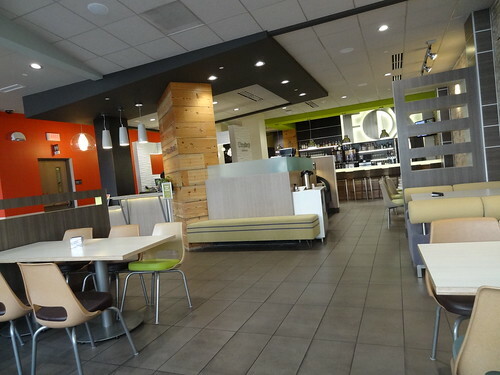 ← Grand Rapids: Grand Getaway !